Purchase 1194 x 1200 pixel digital file by using the Buy Now buttons below. You will receive an email with the download link. You can use the link 5 times to download the digital file. 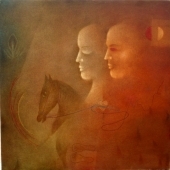 A mystical painting capturing the faint outline of two horsemen on a foggy night. Large format Oil on canvas work 48" x 48" by acclaimed artist Kuppanna Kangdal. Kangdal's sense of proportion, illumination and geometric perfection seems to stem from his background in civil engineering..
New artwork uploaded. A mystical painting capturing the faint outline of two horsemen on a foggy night. Large format Oil on canvas work 48" x 48" by acclaimed artist Kuppanna Kangdal. Kangdal's sense of proportion, illumination and geometric perfection seems to stem from his background in civil engineering. Kuppanna Kangdal was born in 1946 who majored in Civil Engineering from Karnataka University. 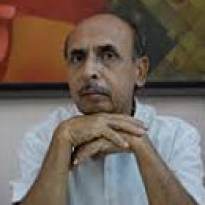 He has had many solo and group shows as well as art camps all throughout India. Exhibitions include those at Orchid Art Gallery, Mangalore, Chitra Kala Parishat Bangalore, Kala Samskar , Hyderabad, Pranam art gallery Bangalore to name a few.